90,000 acres of mountainous terrain, the Italian Dolomites offer a unique corner of the Alps with distinctive geology and a fascinating blend of cultures. Comprising over 90,000 acres of mountainous terrain, the Italian Dolomites offer a unique corner of the Alps with distinctive geology and a fascinating blend of cultures. The geological origin dates back some 230 million years when the rock was deposited in the form of marine sediments and coral in a low open sea (that’s why you can find fossilised shells and marine remains along the paths of these mountains). This material formed the base of the mountains. Much later, around 65 million years ago, the rocks were lifted high up by various tectonic events, and the Alps came into existence. The Dolomites are notable for their composition of pale coloured dolomite -- a limestone like rock formed beneath deep, ancient seas -- atop darker volcanic bedding. The Dolomites owe their name to the Frenchman Déodat Tancrè de Gratet de Dolomieu (1750-1801) who "discovered" the chemical composition (stratified calcium magnesium carbonate) that renders this rock so different from all the rest. These fabulous vertical reefs glow in the changing light and present a startling and dramatic contrast to the pastoral beauty beneath. Located to the south of the main chain of the Alps, the Dolomites are geographically and culturally at a crossroads between Italy to the south and Tyrol to the north. In the First Century, the Romans invaded the Alps and remnants of their culture, particularly in the Ladin speaking villages, still remains. Though the Dolomites have been almost exclusively an Italian possession since after World War I, the culture remains a blend of the Tyrolean, Rhaeto-Roman and Italian influences. 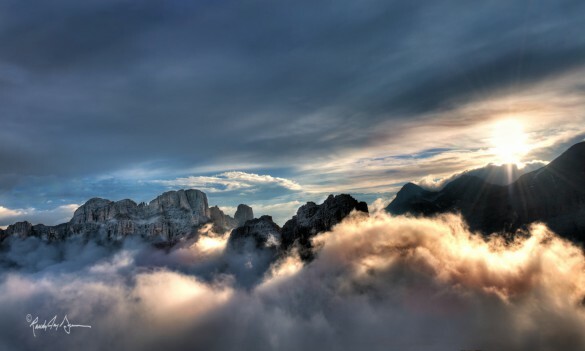 During the First World War, due to their border location and the conflict between the crumbling Austro-Hungarian Empire and Italy, the Dolomites area became a war zone, with many hard-fought battles that often ran along high-altitude mountain crests. The military mule tacks that were constructed to supplement existing shepherd’s path for supply and accessibility, nowadays are part of the notable network of pathways. As you wander among the picturesque villages and rolling green pastures, you may notice a sturdy Italian Gothic tower and an onion domed Tyrolean steeple vying for ascendancy with the looming walls of dolomite. In many places, evidence of the gruelling battle between Italy and Austria is still highly visible. It is an irresistibly fascinating, beautiful and photogenic land. Within the Dolomites exists a number of valleys, including the pastoral and lovely Val Gardena with its Tyrolean flavour, the unique Val Badia, where over 90% of the population speaks Romansch as a first language, and the Ampezzo region, with its strong Italian character. As a result of this, many street signs are written in three languages: Ladin, German and Italian. The northern and eastern tier of the Dolomites is the heart of the range with access for hikers to the Sciliar, Rosengarten, Sassolungo, Puez, Sella and Tofane ranges. The villages beneath are enchanting with their mix of culture and architecture. A number a villages have cobblestone streets that wind around medieval churches. Surrounding each village, expansive pastures that are communally or cooperatively managed are farmed traditionally, with the cows moving to higher pastures, or alps, in the summer, while crops and hay for winter are gathered from the closer fields. Both the annual rhythm of farming and the system of managing the pastures and forests date back to medieval times, and the land has been protected from development, both voluntarily through primogeniture and legally through villages administering laws protecting land from subdivision. In this way, not only is there assured enough fodder for farm animals and produce for the inhabitants, but the traditional landscape and way of life are preserved and enjoyed by all. For more information on booking your hiking, biking, climbing or luxury vacation in the Dolomites please contact us.